A triathlon is a multiple-stage competition, with three separate, continuous portions. 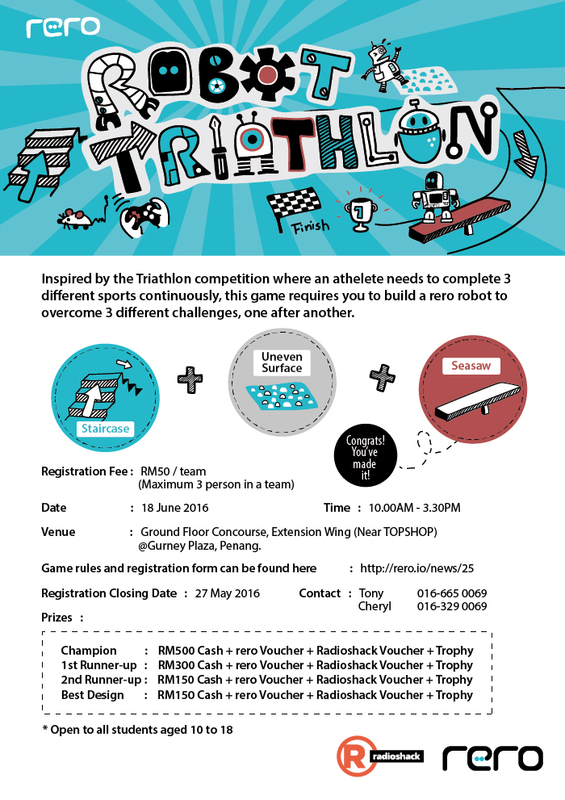 The most common form of a triathlon involves swimming, cycling and running. The sport focuses on the athlete's endured training of the three separate disciplines, as persistent and regular training is required for the athlete to perform well. Robots, on the other hand, don't train, but must be designed to be as versatile as possible, allowing them to perform a multitude of different tasks. Thus, in this competition, teams are required to design robots which are versatile enough to be able to complete all 3 different missions in the Robot Triathlon. For more details about the competition rules and regulations, please refer here. Open to all students aged 10 to 18. You can register here. Closing date is 27th May 2016. *Extended to 3rd June 2016. For further enquiries, please feel free to email or contact us.